Having dinner at the new Italian restaurant, Gabriele Restaurant at the Hotel Adlon Kempinski in Berlin, Germany is a delightful culinary experience with Chef Björn A. Panek deftly creating magic in the kitchen. 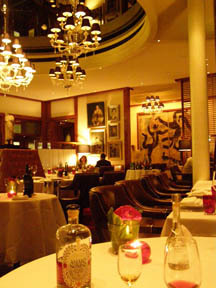 Gabriele Restaurant opened in December 2007 and I was delighted to have dinner there with Edward F. Nesta during a visit to Berlin in March 2008. First of all, the restaurant is gorgeous; enter the door of the intimate restaurant and Italian opera welcomes the guests, there are supple burnt sienna/tobacco leather banquettes to cozy up in, crisp white linens dress the tables, chandeliers with black shades illuminate the room, bold paintings capture the spirit of the restaurant, and lipstick red glass accents draw the eye to take in the stunning ambience; second, and most important, is the chef, namely Björn a. Panek, who has an impeccable "who's who" list of Michelin chef credentials working with Hans Haas of Tantris in Munich (2 Michelin stars), Bobby Brauer of Die Quadriga in Berlin (1 Michelin star), and more recently, with Tim Raue formerly of 44 in Berlin (1 Michelin star) who is now the Executive Chef of the restaurant, MA, that is also part of the Adlon Collection of restaurants. Chef Björn began our dining experience with a lovely Amuse Bouche of minestrone with fish cream, zucchini, red onions, balsamic vinegar and red wine with a few drops of mint oil. 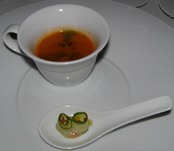 The soup was presented in a coffee cup on a large white dish with a Chinese spoon with thin zucchini curls, and had a rich taste with a subtle hint of sweetness. Accompanied by a glass of prosecco, it hit just the right note. We continued with Cocktail di Astice, which was succulent lobster claw and lobster meat with celery, bell pepper and lattuga that was beautifully presented in a deep glass bowl set in a larger white bowl that had visual appeal and a taste to match with lovely spice notes from basil cress. 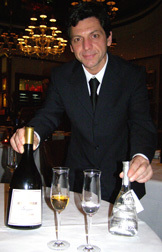 Sommelier Giacomo Anabaldis paired this course with a 1996 Pelago. Next on our grand Italian culinary "journey" was Brodo di Vongole Veraci et Capesante, another rich flavor base of vongole stock, vongole veraci with thyme, marinated tomatoes, and scallops with a curry foam paired with a 2005 Chiaramonte, 13% alc. from Sicily made with 100% ansonica with nice fruit, lemon, and floral notes with a taste of Sicily of sun, minerals, and earth, that was delicious. Continuing with a pasta course, we had Tagliolini in Ribolla Sauce with leek, grapefruit, sea bass and herring caviar, which was a new recipe, and really sang a harmonious melody with a thoughtful melding of flavors. Edward and I had a parting here of our tasting menu; while he selected the marinated duck with artichokes and mustard, beautifully presented with an abundance of flavor, I had Calamari rolls with Carnaroli risotto with peas, lime, and calamaretti. This attractive course featured two calamari "rolls" on a bed of risotto with peas and lime, calamaretti placed on either side of the plate, and garnished with baby greens. Next on the tasting menu was Filetto "Rossini," Beef filet with goose liver, truffle sauce and Barettane onions and Moscato apple, Artichoke crème for Edward, paired with a 2006 Brachetto d'Acqui, 11% alc. "Braida" Giacomo Bologna which elicited notes of black plum and cocoa, had depth of character, and this course was another highlight of the evening. I continued with Sogliola con Caviale di Aringa, Dover sole, lime oil emulsion and herring caviar, fennel and orange salad with tarragon and tarragon crème, which was a gorgeous dish that Ilja Schierz enhanced with a sauce poured tableside. This course was also well paired with a 2006 Russiz Superiore, 13% alc. Sauvignon del Collio with passion fruit, kiwi, banana, fruit aromas and great body. The nose was fabulous and on the palate, divine, with a dry, crisp finish. The dessert of Strato di Ciccolata Sao Tomé was a delicious tower of heavenly flavors presented in a tall martini glass and dressed with a sugar and nut tiara. Spooning through the layers of rich flavors of Sao Tomé chocolate, crumble of Torta della Nonna (grandmother's cake), Galliano crème, lemon fruits, and Caraibico ice cream was an especially nice way to finish the meal. Sommelier Giacomo Annibaldis brought us a tempting selection of Ni' Mia Passito rich with raspberry flavor from Piemonte; Amaro Nonnino with an intense herbaceous nose; and Moscato Rosso, delicious with rose notes, to pair with the dessert and we enjoyed tasting and comparing how each of them complemented the rich flavors of the dessert. Intimate ambience, excellent cuisine, and a passionate staff, I will definitely look forward to returning to Gabriele Restaurant on my next trip to Berlin. Buon Appetito! Read Chefs' Recipes (in English and in German) where Chef Björn a. Panek shares his tempting recipe for Beef Fillet "Rossini" and Pigeon Breast with Treviggiano, Artichoke, Hazelnuts and Lovage. Read other articles on the Hotel Adlon Kempinski: Hotels and Resorts, Adlon Day Spa, Lorenz Adlon, Chefs' Recipes: Lorenz Adlon Recipes, Hotel Adlon Kempinski Recipes, Hotel Adlon Kempinski Recipes in German, Happy 100th Anniversary Hotel Adlon Kempinski and Destination: Berlin - A Feast for the Senses.